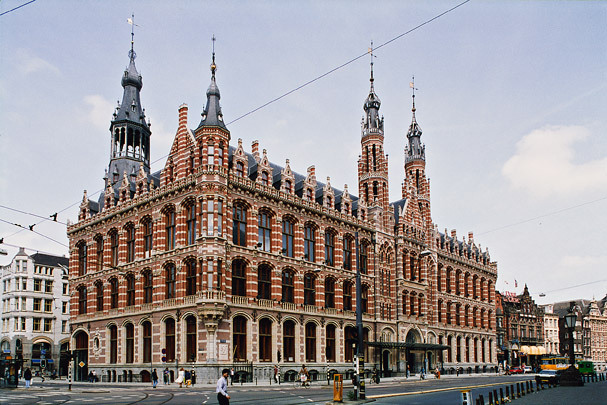 In 1993 the imposing Neo-Gothic main post office of government architect C.H. Peters was restored and recast as a shopping centre. Two existing light courts were enlarged for the purpose and a third inner court was given a glass roof. Ruijssenaars retained the existing main entry and stairtowers, supplementing them with two escalator systems. The service entrance on Raadhuisstraat was enlarged into a second entry to the shopping centre. In all, there are 6000 m2 of luxury stores ranged along the outer walls, separated from the galleries by airy folding partitions kept clear of the ceiling.